With innovative designs and contemporary finishes, Oggi’s kitchen, bar and bath wares are truly tomorrow’s house wares today. 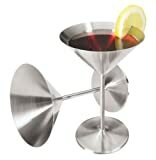 Oggi’s Stainless Steel Martini Goblets are no exception. Goblets are made of durable stainless steel. With their unique look these goblets are sure to grab everyone's attention. Set of two. Goblets have a 8-ounce capacity and are ideal for martinis, gibsons, giblets and Manhattans.